Callan has received acclaim for his “Book of the Year” finalist, Badges, Bears, and Eagles—The True-Life Adventures of a California Fish and Game Warden, published by Coffeetown Press in Seattle. His sequel, The Game Warden’s Son, is scheduled for release in March 2016. Steve grew up in the small Northern California farm town of Orland, where he spent his high school years playing baseball, basketball, hunting, and fishing. With an insatiable interest in wildlife, he never missed an opportunity to ride along on patrol with his father, a California Fish and Game warden. Steve went on to graduate from CSU, Chico, and attended graduate school at CSU, Sacramento. Hired by the California Department of Fish and Game in 1974, he began his career as a game warden near the Colorado River, promoted to patrol lieutenant in the Riverside/San Bernardino area, and spent the remainder of his thirty-year enforcement career in Shasta County. Callan has earned numerous awards for his work in wildlife protection. 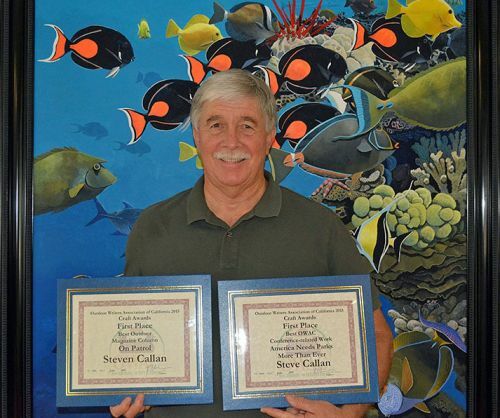 Passionate about the environment, Steve and his wife, Kathleen, are avid kayakers, anglers, bird watchers, and scuba divers. They currently live in the Redding area.